On a crisp Sunday afternoon, what began as a quiet protest at Cabot Square in downtown Montreal ended with one protester facing off against a moving train. In the end, two were arrested on a charge of mischief. At 1 p.m. on Sunday, several groups gathered in solidarity with the Camp de la Rivière protesters, who are currently demonstrating against Junex and other oil drilling companies in the Gaspé Peninsula, and against government funding of these companies. Protesters gathered to voice their environmental concerns and to stand in solidarity with Indigenous people, as the drilling has been taking place on unceded Mi’kmaq territory. The protest came on the heels of others organized in larger cities, such as one in front of the company’s head office in Quebec City last week. The organizers of the protest—who wished to remain anonymous because of the illegal nature of their actions later in the day—explained that they began the march at Cabot Square because of the statue of John Cabot. They explained that the existence of the statue was a symbol of the genocide and assimilation of Indigenous people. They hung a Mi’kmaq flag at the base of the statue for their speech. “The people at the Camp de la Rivière called for a week of action […] they wanted the mobilisation to leave Gaspésie and spread all over Quebec, so we organized the protest because of this,” said one of the organizers. “We also wanted people to understand that this drilling exists so that large cities like Montreal can profit off it, at the destruction of peripheral regions like Gaspé,” they continued. As they reached the end of a downtown street, they were met with a police blockade. About an hour after, they stopped by train tracks in St. Henri. Several of the protesters watched and cheered as one person stood in front of a moving Via Rail train, with the words “Canada 150” scrawled on its side. “Move, you’re going to kill yourself,” a police officer shouted, but the protester didn’t budge, stalling the train for over two hours. The rest of the protesters joined them on the tracks, serving lunch and reciting speeches. The organizer added that Junex’s projects and similar companies threaten the lives of species in the area, and the well-being and quality of life of the people in the area. He had been at the Camp de la Rivière himself a while ago, and has recently heard back from the camp. “From the news we were given, people are starting to prepare for the winter. They want the camp to continue until, this isn’t confirmed, but until there aren’t just projects from Junex but also from all petroleum companies in Gaspésie,” he said. The crowd was dispersed by police around 4:30 pm. Two women, 21 and 23 years old, were arrested for mischief and appeared in court Monday. 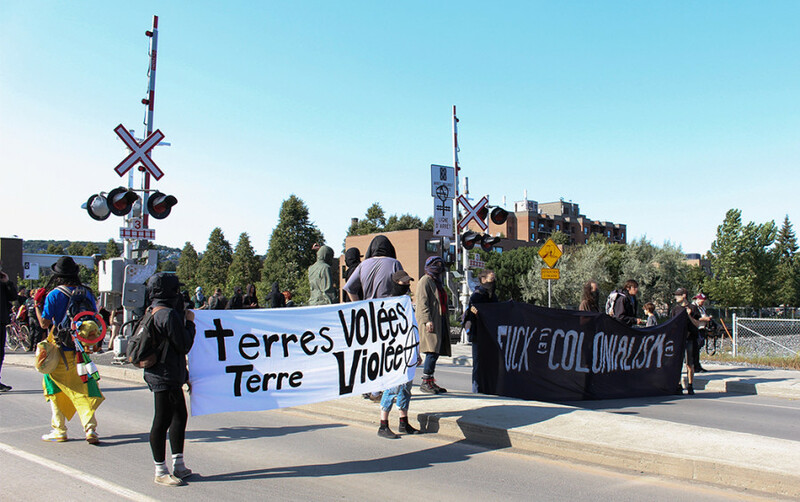 Before the speeches began at Cabot Square, some anti-colonial and environmental groups stood in the park with signs and information kiosks, explaining why they were denouncing the Junex project. These protestors were not involved in the illegal action that occurred later in the day. Several protesters explained that their goal at the protest was to ensure the preservation of resources and the planet for future generations, and the right to clean drinking water for all. Robert McBryde, from the Leap Manifesto, explained that the core of the issue is in line with what the organization represents and it was important for him to be there. George Karpat, an activist affiliated with several groups including the Leap Manifesto, explained that the term “radical” is often associated with those protesting to save the planet, but that he feels the term should be turned around to describe extraction companies and put them in a negative light.